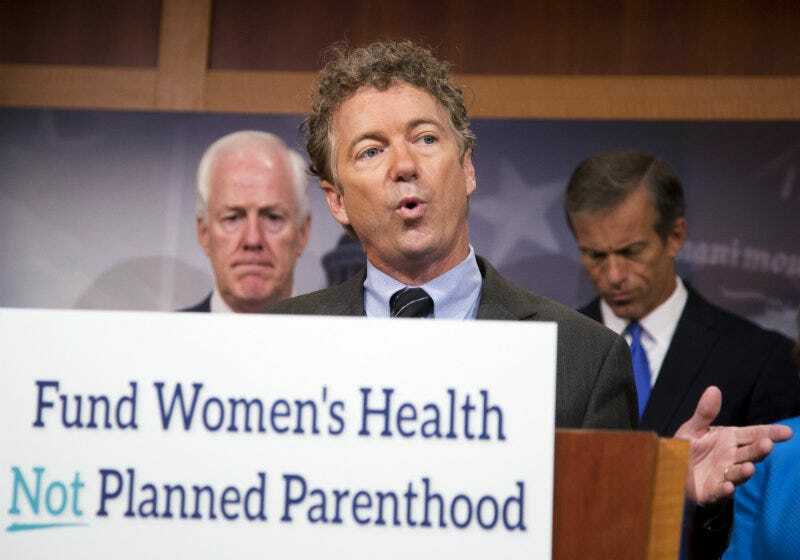 The Senate is expected to vote Monday on S. 1881, a bill to “defund Planned Parenthood,” i.e. take away $528 million in federal funding from the non-profit on the strength of some sketchy videos from some sketchy folks. And if they don’t manage to defund PP, GOP senators are more than happy to shut down the government. Again. Led by Senator Ted Cruz. Again. The budget expires October 1. Senate Democrats are not going to vote to defund Planned Parenthood. President Obama is likely not going to sign a budget that defunds Planned Parenthood. You see where this is going. The Week’s Paul Waldman argues that the GOP won’t try to shut down the government again, because they “can’t get enough public support” for the idea and because in the case of the ACA in 2013, it didn’t work. This argument presumes that Ted Cruz et. al. make their decisions based on a sane and rational set of considerations. Those sound like the words of people willing to consider a compromise to keep the government functioning. For sure. Correction: An earlier version of this piece referred to Planned Parenthood’s federal funding as entirely Title X family planning funds. Planned Parenthood says the majority of its federal funding actually comes from reimbursements for providing care to Medicaid payments, while a smaller portion comes from Title X. I regret the error.